Together, they stood on the lawn and stared up at the roof. Clint Barner peered up with a critical eye. Mel Hallowell had no clue what she was looking at but she hoped she did. “Well,” old Clint said with a scowl. He wasn’t friendly but he wasn’t unfriendly either. As neighbors went, he was a solid B. “You didn’t shovel the roof, didya?” His accent was thick, even for their rural town, forty miles inland and twenty miles due south of Bangor. Mel shifted slightly. Did he say “shovel the roof?” “I shoveled,” she said and beside her, Rufus the dog glanced at the driveway as if he knew exactly what she meant. She waved a hand and he trotted back to the house. “Well,” he replied. “You didn’t do it recent, I’d say.” He put his hands into the pockets of overalls that were likely older than Mel and leaned back on his heels. He took a deep breath and whistled. There were many things Mel wanted to say in reply. She wanted to tell him that she was cold and could they please go inside and discuss her shortcomings in the warmth of her woodstove. She wanted to leave him there, mulling things over and pondering the next thing he wanted to say because this was Maine and you have time, doncha? and go back to that woodstove and her Greek yogurt and granola and half of a banana that sat on the counter. She wanted, badly, to remind him that she didn’t want this house, that she was left this house, and that no, she didn’t know she had to shovel the roof, is that what people did around here, climbing up on their roof with a shovel and did they have snow blowers, did they haul that up there, was this really something people grew up knowing? Mel imagined what would happen if she unleashed that torrent of words on old Clint, if it would be like dumping a bucket of old hair on a turtle. How long, she wondered, would it take him to shake it off? Congratulations to Amber P., the winner of our giveaway! Amber has won a delectable ice cream sundae kit from Jeni’s Splendid Ice Creams. Thank you to everyone who entered and thank you for telling us what kind of recipes you’re loving right now- this will be a big help in deciding what we should make for you in our 4th year! Here in Maine, winter is long. I couldn’t help but laugh when I read a blurb in Bon Appetit this month (and I agree with Luisa completely, by the way. Not sure a subscription renewal is in my future. The recipes are great but oiy. ), something about how Mainers don’t complain about the cold even though March is especially brutal here. So tough, we are up here where the ground is still frozen solid and the snow lingers. Yeah, okay. I don’t know who they interviewed (maybe it’s that one guy in the BA office who is very smug about his Bean boots? I don’t know) but the people I’ve met here love to talk about the weather and OH, they are not afraid to bemoan it with the best of them. Sure, you meet tons of people who love the cold and embrace it but there’s just as many who step outside to a 20 degree day at the end of March and throw a complete and utter temper tantrum to rival anything you might hear echoing in Boston or New York or Chicago. Mutual survival of the long winter is how we bond with each other and complaining about it is a crucial component of that bonding. Having said that… there is a part of living in Maine and the dregs of March that I’ve embraced completely and utterly, with an open, fluttering heart. And that is Maine Maple Sunday. On the fourth Sunday of this cold, bitter month, the sugarhouses in Maine open their doors and host pancake breakfasts, offer up maple cotton candy and smothered ice cream, hayrides and the like. It’s… magic. This year it was incredibly cold but thousands of us were undettered and lined up for smoky, sweet treats. Because syrup. Syrup. 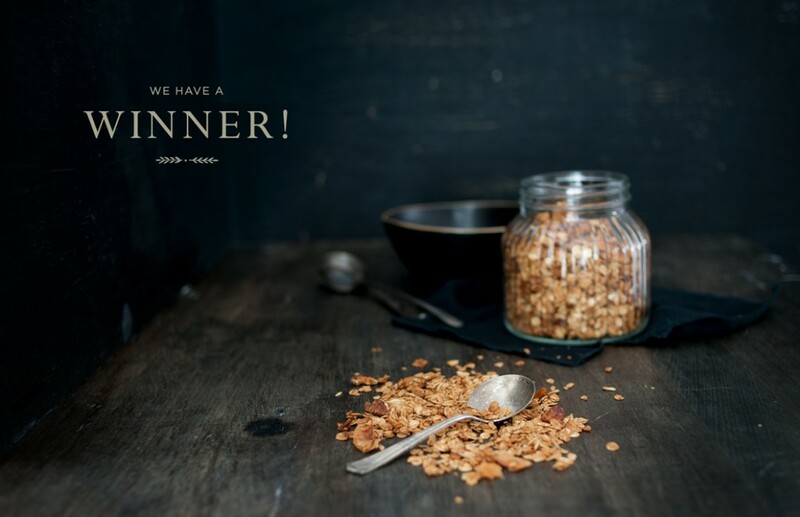 On the crowded list of things I planned to make with my haul, this granola was firmly at the top. It satisfies all of my maple requirements- salty, sweet, and crunchy and you can eat it by the handful. The only thing I’d add is a sprinkling of dried blueberries (Maine all the way). And Joy made it when she came to visit Portland, to boot. For our fourth year, it’s a very good place to start. 1. Preheat oven to 325° F. Line two baking sheets with parchment paper and set aside. 2. In a large bowl, toss together coconut, pecans, rolled oats, cinnamon, and salt. 3. In a medium suacepan over low heat, stir together the oil, maple syrup, and honey. Stir until melted together. Remove from heat and add vanilla extract. Stir together. 4. Add the wet ingredients, all at once, to the rolled oat mixture. Toss to coat, insuring that all of the dry ingredients are coated in the maple syrup mixture. Divide the mixture between the two prepared baking pans. Spread into an even layer. 5. Bake granola for 30 about minutes (original recipe said 45 minutes but one of the pans burned. The other was done at 30 minutes so watch your granola, people! ), removing the pans from the oven twice during baking to toss and stir. Once mixture is evenly browned and toasted, remove from the oven and allow to cool completely. 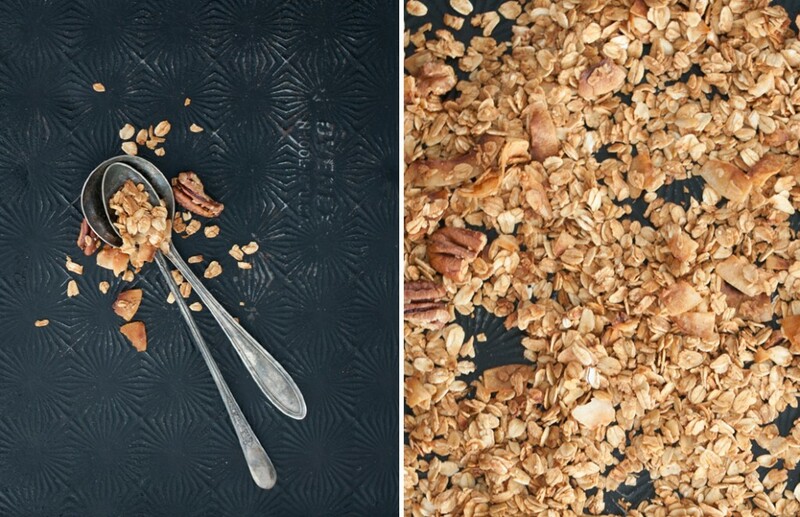 Add dried fruit and stire granola in an airtight container at room temperature. Such a yummy breakfast!! I love a good granola. 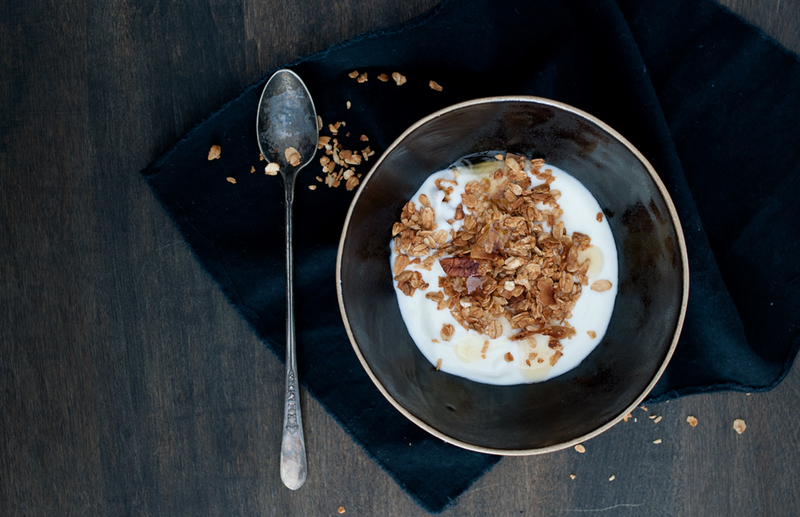 As a massive fan of home-made granola this recipe is just ideal for me. You definitely can consider I will be making it! Yes to all the comments about BA. Once, they were reviewing steak knives and apparently thought that it made sense to promote an $1100 knife. That’s per knife. A whopping $9150 for a set of 8. I almost fell out of bed. I don’t know who lives that kind of life, the life of thousand dollar steak knives, but it is most certainly not me.